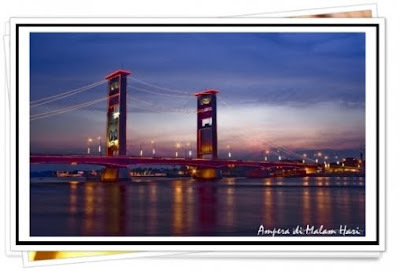 Ampera Bridge is a bridge in the city of Palembang, South Sumatra Province, Indonesia. 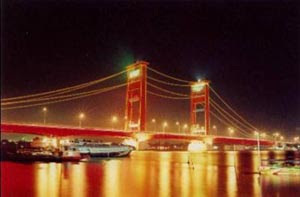 Ampera bridge, which has become a symbol of the city, located in the middle of the city of Palembang, linking regions Seberang Ulu and Seberang Ilir separated by the Musi River. At first, the bridge along the 1177 meters with a width of 22 meters, called Bridge Bung Karno. Construction of this bridge started in April 1962, after obtaining approval from President Sukarno. Construction costs taken from the Japanese war reparation funds. Not only the cost, the program uses the bridge experts from these countries. Bridge dedication in 1965 made exactly on September 30, 1965 By Letjend Ahmad Yani (Mr.Yani evening and early morning Go home 65 to October 1 Victim G.30 S PKI), and confirmed the name of Bung Karno as a bridge. However, after the political upheaval in 1966, when the anti-Sukarno very strong, the bridge's name was changed to Ampera Bridge. 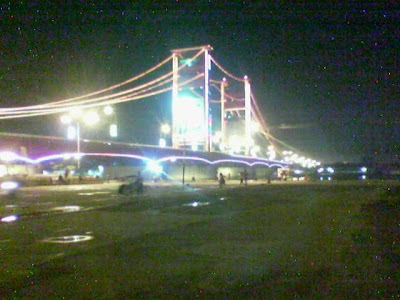 but people prefer to call palembang this bridge with the title "Project Musi"
The middle part Ampera Bridge, when the newly completed, 71.90 meters long, 22 meters wide. Part of the overall weight of the bridge which was 944 tons can be lifted with a velocity of about 10 meters per minute. Two of the lifting tower as high as it stood 63 feet tall. The distance between the two towers is 75 meters. The two towers are equipped with two each pendulum weights about 500 tons. In the beginning, the middle of the body of this bridge to be lifted up so that the mast is not caught by the body underneath the bridge. The center of the bridge can be removed with mechanical equipment, two pendulum respective weights about 500 tons in the two towers. Appointment speed of about 10 meters per minute with a total time required to lift full-bridge for 30 minutes. At the center of the bridge removed, the ship with 60 meters wide and with a maximum height of 44.50 meters, can pass across the Musi River. If the center of the bridge is not removed, the maximum height that the ship could pass under the bridge Ampera only nine meters from the surface of the river water. 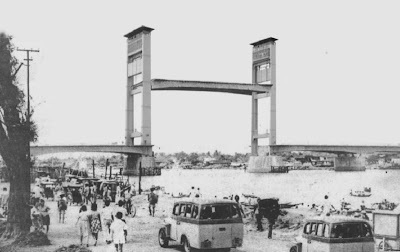 Since 1970, Bridge no longer Ampera raised down. The reason, the time used for this lift bridge, which is about 30 minutes, disturbing the traffic flow between Seberang Ulu and Seberang Ilir, Palembang two regions separated by the River Musi. Another reason because there is no large ship can sail on the River Musi. The longer the more shallow river musi cause Musi River navigable for ships can not huge, until now. In 1990, two pendulum weights for raising and lowering the center of the bridge, which each weighing 500 tons, dismantled and sent down for fear that if at any time it fell and hit passers-by on the bridge. 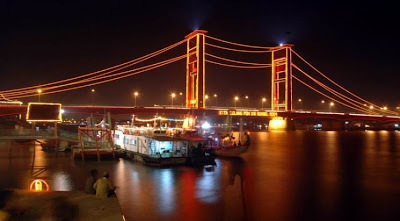 "Imagine if it happened to an object weighing our heads,"
Ampera bridge had been renovated in 1981, with spending of funds of about USD 850 million. Renovations carried out after concerns over the threat appears Ampera Bridge damage could make it collapse. Along with the euphoria of reform in 1997, some parts of this bridge is known thieves stripped. Theft is done by climbing the tower bridge, and cut some parts of the bridge was not working. Color bridge had already experienced 3 times the change from start up gray continued in 1992 in yellow and the last change in 2002 to red until now. 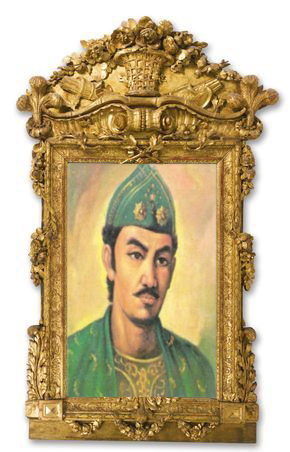 Currently, the developing discourse on the importance of bridge construction Musi III and Musi IV, which connects between Seberang Seberang Ulu and Ilir Palembang. Construction of two bridges are intended to bridge Ampera not overloaded vehicles passing, as well as for more open Seberang Ulu area. 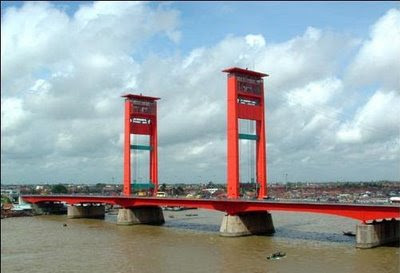 Hopes some of Palembang residents who wish to see Bridge Ampera as ever, seems difficult to materialize.